You are here: Home › Ambulance Services › Doctor’s dedication to the ambulance service recognised. 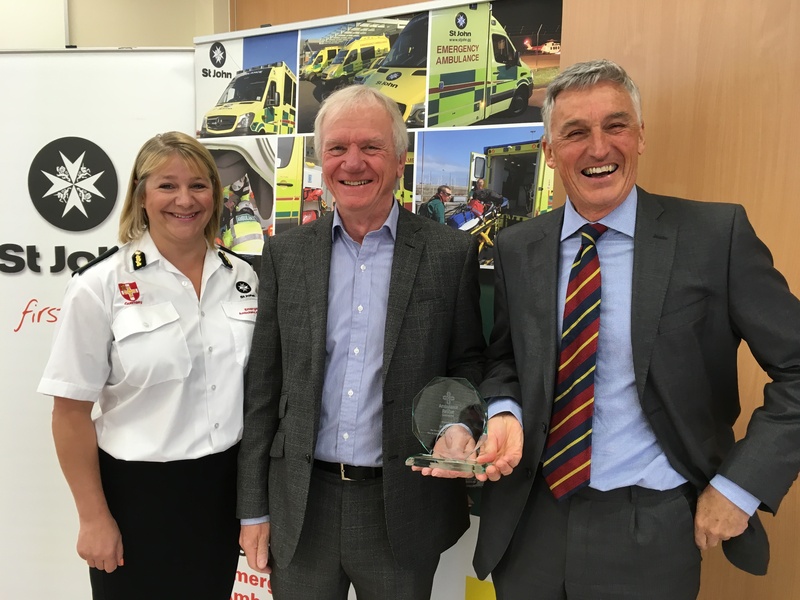 A former Guernsey doctor who served as a member of the SJEAS Clinical Steering Committee has been thanked for his service following his recent retirement. Dr Brian Parkin joined the newly formed committee as chairman in September 2012. Since that first meeting and despite a number of membership changes during the six and a half year period Dr Parkin was an ever present member, sharing his knowledge and experience. Chief Officer Ali Marquis said “Apart from the aforementioned knowledge and experience, Dr Parkin has provided the committee with a calm, measured approach to all discussions and decision making, in the interests of promoting greater clinical awareness and the clinical progress of the SJEAS. Dr Parkin was presented with an engraved trophy by Ali Marquis and the chair of the SJEAS board Steve Le Page.